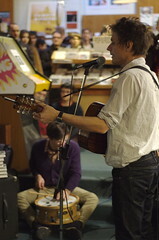 Mattesque has a some really nice photos of Dean & Britta's instore perfromance at Zulu Records on Flickr. I love the casual look of the band lounging around Dean. 13 Most Beautiful's next stop is in San Francisco tomorrow (Tuesday) night at the Palace of Fine Arts.